If you’re riding a motorcycle, you are 35 times more likely to have a deadly accident then you are other vehicles. Motorcycles are involved in one of 10 accidents on the road; even though there are less of them, your chances of being in an accident while riding one are far greater. Motorcycle accidents are fast, scary and dangerous. When you’ve been injured, seek the help of a motorcycle accident attorney who will fight for your rights, keep the process simple and pursue justice for you. In one eight-year period, 1.2 million motorcyclists were badly injured in crashes, and 34,000 riders were killed. In the blink of an eye, everything changes. When you or a loved one are in a motorcycle accident, a motorcycle lawyer will help you reclaim your life and work to get you fair compensation. We are here when you need us 24/7. What Should I Do If I am in a Motorcycle Accident Today? Simple… Get help. A motorcycle accident can leave you confused, overwhelmed and scared. Maybe the driver who hit you didn’t see you. Maybe debris in the road caused you to skid. Whatever the circumstances, there are a few things you need to do. If you are on the scene of a motorcycle accident, call 911 for the police and paramedics. Other than the police officer who arrives on the scene, do not talk to anyone else. Any statements you make can be an admission, can be used to build a case against you. If you can, document everything. Take pictures of the accident scene, your motorcycle and the vehicle or other party involved in your accident. Document your injuries. Make sure to seek medical attention! You are probably in shock and may not have an accurate grasp of any sustained injuries! What kind of injuries can I suffer from my accident? As a motorcyclist, you are in a highly vulnerable position. It is hard for others to see you on the road, and there is less structure to protect you in case of an accident. Injuries suffered in a motorcycle accident can range from simple scratches to life-threatening damage and, at worse, fatalities. Each year in South Carolina, approximately 100 motorcyclists are killed. Countless more suffer life-changing injuries. There are many factors that can contribute to your accident. The important key is that whomever (or whatever) is deemed liable for the crash is held financially responsible. If the actions of a person have caused your accident, they are liable. If debris, a pothole or road design issue contributed to your accident, a government agency might be liable. In fact, 47% of fatal motorcycle accidents involve a collision with another vehicle. An experienced motorcycle lawyer will help determine who is liable in your specific case. The majority of accidents occur when a driver does not see a motorcycle he or she shares the road with or sees the motorcycle too late to react properly. When a driver is texting, talking or distracted behind the wheel they are less likely to see a motorcycle on the road. Many times a motorist does not see a motorcycle on the road when making a left hand turn or approaching an intersection. Because of the size of a motorcycle and the speed at which it travels, motorcycles are more susceptible to vehicle blind spots. When you have lost a loved, it is normal to be angry, grief-stricken and confused. You may want to seek justice and for someone to “own up” to the responsibility of your loss. In this case, filing a wrongful death lawsuit [link to wrongful death page]can be a way to do that. A motorcycle accident attorney can evaluate your case, determine liability and help you to achieve financial restitution. This does not bring your loved one back but it will help to assure that other cyclists do not lose their lives in the future by the same reckless circumstances in your case. Motorcycle crashes account for 13 percent of all motor vehicle crash deaths. 52 percent of motorcycle fatalities occur on the weekends; crashes are more likely to occur on the weekend after 6p.m. What should you do after a your accident occurs? The number one thing you should do after a motorcyle accident, assuming that you and any passengers involved are safe, is to secure the help of a motorcycle crash attorney. Time is of essence. It’s important to move fast! An attorney must start working on your behalf before: Evidence needed to support your case disappears Witnesses involved are unable to be contacted or forget what they observed The statute of limitations expires for filing your claim or lawsuit. We know you are not a number. You have a family, a job and responsibilities. 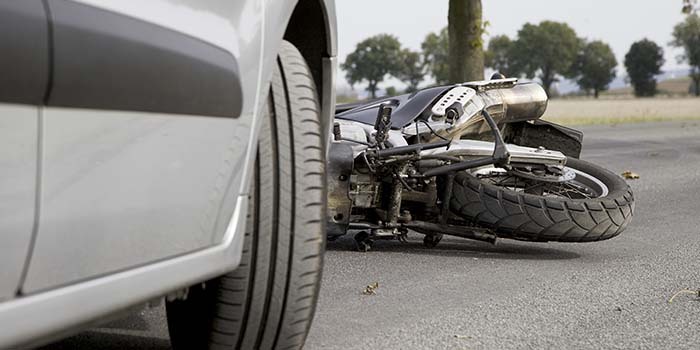 After a motorcycle accident you may be overwhelmed and facing serious injuries. Money may be tight. You may be without the earned income from a family member who is injured and unable to work. When you are ready for help, contact The Green Law Firm for a consultation at NO RISK to you! We’ll review your case and discuss your options. Remember, we receive no compensation unless you do. From start to finish, Bill Green and his experienced legal team will handle every detail of your case to make sure you get the compensation you deserve and are treated fairly and with respect. Call us today at 843-747-2455, and connect with a member of our team. Help is on the way!